With more than 1.6 billion websites existing on the internet, you need a site that effectively responds to the requirements of users to dominate the World Wide Web. Dynamic web design makes the websites highly interactive by empowering them with different features like customizable interface, tailored user-experience, integrated content management system, search functionality, SEO elements, etc. It also makes it easy to add and update a diverse range of content like text, images, videos, product descriptions etc., which otherwise required technical expertise when updated in a static website. A dynamic website is an ideal solution for the large companies that seek to post and manage a wide array of their products and services with ease. The dynamic interface of the websites let you create the content/graphics without any specific IT knowledge and can be updated within the company. Dynamic websites are appreciated widely due to the high scalability they offer. By selecting a dynamic web design for your firm, you open up to a wide variety of modules that offer immense interactive features on the page in the form of articles, blogs, e-commerce, event calendars, secure login, forums, etc. Due to the frequent content updates, a dynamic website is favored more by the search engines. The web crawlers index the pages and automatically rank higher the content that is new and freshly updated. Though the dynamic websites are costlier to develop compared to a static site, but the savings later surpass the initial investments. They are cheaper to maintain and modify as the updates are performed within the company. Dynamic Websites can be easily edited and added with new web pages. After the creation, there is no need to depend on the developers for further modifications. You can make changes anytime and anywhere on your own. Advantages Of Dynamic Web Designing ? As each part of the webpage is separate in a dynamic website, it gets really easy to implement updates across multiple pages at once. For instance, if you seek to make change to your website’s navigation, you will have to make the change at one place and it will be reflected on all the pages that contains the file. On the other hand multiple pages are required to be edited while implementing an update on a static website. This makes the procedure repetitive, tiring, and prone to errors. Static websites are tough to edit and has a lengthy process. One has to download the HTML page from the server to change and upload the content back to the server. The entire process requires an expert webmaster with an understanding of how the HTML works, which means you will need a developer every time for changes. Modern dynamic websites on the other hand, are equipped with web-based CMS. It offers a separate space on the website for editing, adding or uploading pictures or pages. The content of the page is generally stored in the database located on the server, which is produced in real time when requested by page visitor. The CMS encompasses server side caching engine which stores temporal copies of the page content in order to speed-up the real-time page generation. Search engines love the pages that have unique content and are linked to relevant pages. While relevance is one of the major reasons for traffic traction, it could become really difficult to find all relevant content for each page in a large website. A dynamic script covers this drawback effectively. It examines each and every page in the database and generates a dynamic list with the most relevant content. In dynamic website you also get an option to customize your product search thoroughly as per your requirements. A web based product administrator is generally used for managing all the products in a Dynamic website. All you need to do is add the new product, and choose an appropriate product listing and category. Once you are done with it, the details are generated dynamically. A dynamic website lets you dynamically extract updated information from the third party server when needed. For instance, if currency exchange or weather forecast is needed, the developer would have to write a code that contacts third party server in the real-time and extract the updated information from the source. Where a static website lacks on this feature, the server side scripting on which dynamic websites allows it to get the data effectively. With a dynamic website, you get an option to add news articles that are displayed as a list sorted according to date. In certain cases a small version of that list displayed in the side column of each page. It is only possible with Dynamic website approach; else you would have to edit every page whenever a new addition will be made to the list. Usually, each news article has a comment section at the bottom of the page. All the comments made by viewers are displayed in the content manager, but only the comments approved by the website administrator are displayed on the website. Search option becomes really vital in case your website owns plethora of product pages. This assists the user to find the product/service he is looking on the page easily. The option is present exclusively in the dynamic websites, as the server has to check each page present on the database to extract the information. Besides simply searching, the “search on your website” also examines the most relevant pages and the search listings are sorted on the basis of this relevancy. 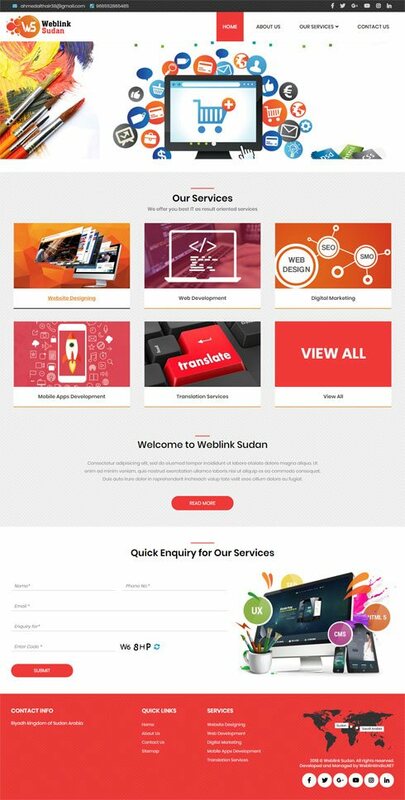 Weblink Sudan is a premier name in the service community of Riyadh, Saudi Arabia and specialized in providing services for website designing, web development, digital marketing, mobile apps development and translation services. Supported by years of experience and diligent workforce, we cater to needs of SMEs and large enterprises. Keeping ongoing industry trends in notice, we provide solutions with a novel approach. The website of Weblink Sudan is specially designed by a well-known website designing and development company, namely WeblinkIndia.Net Pvt. Ltd., which is based in Delhi, India. Arab Yoga Foundation was established in the year 2010, by Arab yogacharya Nouf Marwaai. Nouf Marwaai has been in association with various esteemed yoga organizations and is expertise in various yoga techniques and exercises. A self-motivated entrepreneur, she is a valuable patron of Yoga and Ayurveda in Saudi Arabia and the Gulf region. The website for her Arab Yoga Foundation is designed by WeblinkIndia.Net. The well-known SEO Company of India has years of experience in Dynamic Web Designing, Web Hosting and PHP Web Development. Shailly Hair & Beauty is a renowned salon that is engaged in providing some of the best beauty services. We offer services like facial, threading, nails, waxing, hair, head message, and various others. The salon also provides services like SHR (IPL) Pain Free Hair Removal, LED Light Photo Rejuvenation, Hydrodermabrasion, Intraceuticals Oxygen Treatment, and various others. We have a team of experienced beauty experts that conducts every service carefully. WeblinkIndia.Net Pvt. Ltd. has developed and managed the website of Shailly Hair & Beauty. Owing to the vast expertise of our skilled professionals and industry experience of 18+ years, we strive to deliver you an unswerving and foremost website, tailored according to the requirements of your business. At WeblinkIndia.net, we have been working on web development projects for more than a decade and have designed some of the finest Dynamic Websites for small, medium and big enterprises from all over the world. At WeblinkIndia.net, we want to give even the small companies an opportunity to create an impressive online presence by leveraging upon our web designing services. We have kept our Dynamic web designing package prices as pocket-friendly as possible so that all types of business can take the benefit of our first-grade web designing solutions. In our journey of 18+ years, we have built a reputation for delivering the projects on time, along with impeccable after sales services. We promise our clients 24x7 technical support through our live chat/phone/e-mail. In the last 18 years, we have set a benchmark in the field of web development/designing, and our dynamic website designing is perhaps one of the best paradigms to exhibit our excellence. Our “consumer-first” approach drives us to deliver unparalleled services custom-made to fit your business requirements. We continue to assist our clients until they are fully satisfied, and serve their queries even after the project is completed.